A further engraving from the 1905 catalogue of W.G. Bagnall Ltd in the Society Collection. 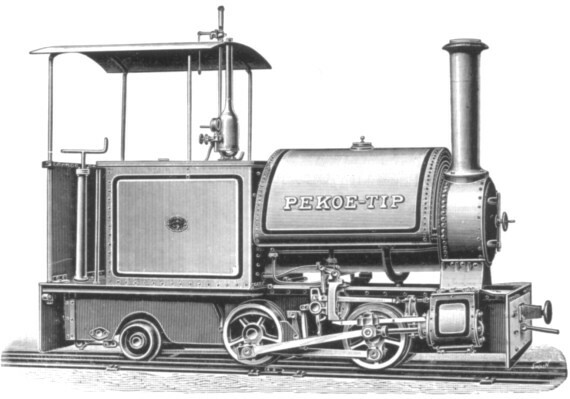 PEKOE‑TIP is described as a narrow gauge locomotive "for portable or light railways" and is said to represent "an engine the same as "MERCEDES," with the addition of a trailing bogie [which] allows for a greater carrying capacity of water and other fuel, and extra space on the foot-plate. If desired, the engine could be supplied having the six wheels coupled, when the price would be 2½ per cent. extra." If it was arranged for oil-burning the price was increased by 10 per cent, while packing for overseas shipment was 5 per cent extra. The PEKOE‑TIP type was available with 4½ or 5in cylinders and for gauges between 1ft 6in and 2ft 0in. We are grateful to Allan Baker for the following additional information on the original PEKOE‑TIP (Bagnall 1438 of 1894). It was ordered by, and supplied to, the Jokai (Assam) Tea Co Ltd, Assam, India, and was a 2ft gauge loco with 1ft 6in wheels and 5½in by 9in cylinders. (Note that the Bagnall advert for this type claimed only 4½in and 5in cylinders.) PEKOE‑TIP was fitted with Baguley valve gear and a circular steel firebox: the grate area of this was 3¼sq ft. Working pressure was 140 lb per sq in and the loco weighed six tons in working order. A new boiler, ordered by the original customer, was despatched on 30th January 1926. PITTSBURGH LOCOMOTIVE WORKS. 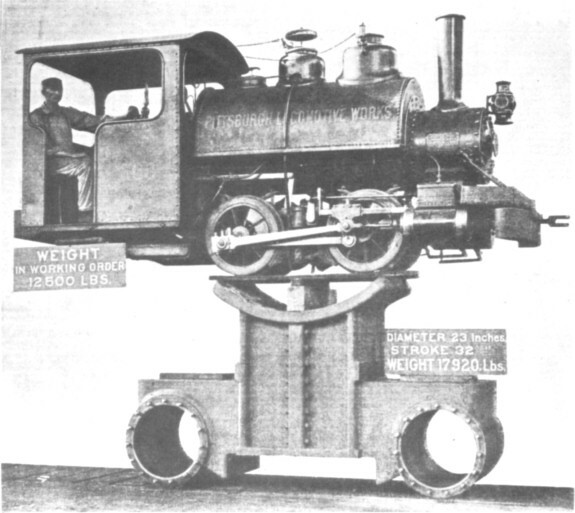 The "somewhat startling" illustration accompanying this paragraph was posed by the Pittsburgh Locomotive and Car Works in 1898 to emphasise the size of the parts of its latest and greatest creation, a 103‑ton 2‑8‑0 for the Union Railroad. Announced as "the largest locomotive engine ever constructed", its 8‑ton cylinder saddle casting provided a photogenic perch for the 24in gauge shunter which will be of more interest to our readers. Used "about the Pittsburgh Locomotive Works for transmitting material between the departments", the dimensions of this small engine were :- cylinders 6in x 10in ; wheels 26½in ; wheelbase 48in ; diameter of boiler 24in ; working pressure 160 lb per sq in ; weight 5½ tons ; fuel, coke. Its works number was 1454. (Information and illustration from "The Engineer" of 11th November 1898. — REW).